Dr. Victor E. Schulze IV is the oldest son of Dr. Victor E. Schulze III and Elizabeth G. Schulze. He is the oldest of three siblings, he has a twin sister and young brother. He is a San Angelo Native who graduated from Angelo State with a Bachelor in Animal Science. He graduated from Texas A & M School of Veterinary Medicine in 2010. Animals have always been a huge part of his life even from the time he was young. He spent many mornings waking up early in elementary school to take care of his pet turtle Thunder before school. In junior high, he competed in 4H on a beautiful quarter Shire three quarters Thoroughbred named Talk Radio, who he fondly called Baby. During his studies at Texas A & M he rescued two sweet dogs, Sugar and Daisy. You may find him on his time off walking with his wife, children and his dogs. Dr. Zachary Schulze is the youngest of the three siblings, the older two are the twins Victor and Elizabeth. He also graduated from Angelo State University with a Bachelor in Animal Science. 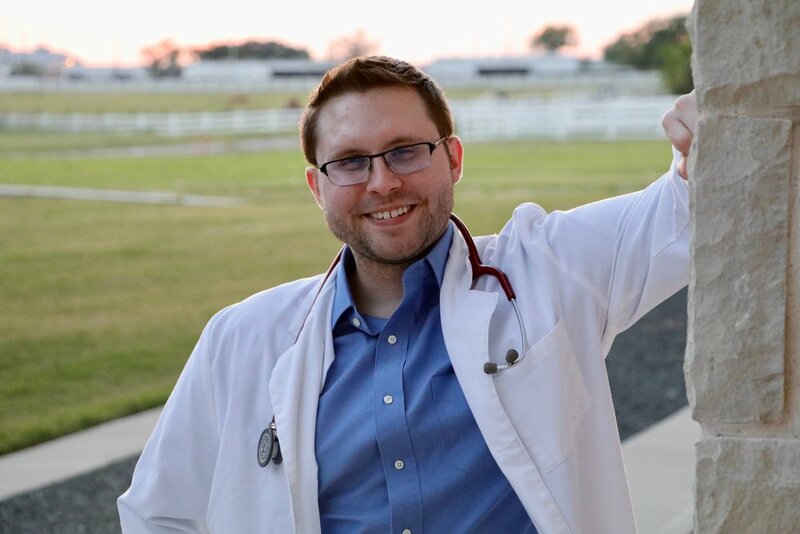 He graduated from Texas A & M School of Veterinary Medicine in May of 2018. His compassion for pets is apparent in his willingness to do whatever it takes to ensure good health for all pets. His journey to entering the animal health field began with a yearlong fight to save his precious Scottish terrier, Lincoln Bark. He spent many nights alongside his sister and parents administering IV fluids and blood transfusions. Lincoln eventually lost his fight to hemolytic anemia. Since then, he has made it his passion to help others with compassion for their furry companions. On his free time, you may catch him playing with his two dogs Chewbacca and Joker or cheering on his goddaughter at recitals, basketball games or swim lessons. Zachary has an outgoing personality and positive outlook on life. Feel free to stop by and exchange some laughs while your pet receives the best care at North Bentwood Veterinary Hospital and Boarding. Elizabeth Edwards is the twin sister to Victor Schulze and older sister to Zachary Schuzle. She also graduated with a Bachelor in Animal Science from Angelo State University. She has a passion for Animal Behavior and helping pets with easing their muscle pains. She has always loved rescuing and seeing dogs find their forever home. During her studies at Angelo State she rescued two loving canines, Piper (a Labrador mix) and Chili ( a Grey hound mix). She fought for a year to save the life of her beloved Chili, who died in her arms of lymphoma. Her twin brother helped her extend the life of Piper for over a year, while battling hepatitis, which she contracted from an over the counter dog food. Since then, she has made it her passion to help pet owners become educated about the different types of pet nutrition and ensuring that their pets receive the best nutrition for them. In her spare time, you may find her enjoying a long walk with her husband, daughter and two Great Danes, Monkey Boots and Ladybug. She is also her daughters number one fan and is cheering her on in whatever activity she chooses to participate in, whether it is a recital, playing basketball or showing a dog.